A lovely girl turns 13 this Sunday and her name is Makalea. I used to babysit Makalea when she was still little enough to just cuddle up next to me and watch a movie, when she would show me all her toys in her closet, and new sparkly lip glosses. Now, Makalea is turning 13 and entering her teen years. As I write this I find myself shocked that time has passed so quickly. That enough time has passed for this beautiful little girl to turn into a beautiful teenager. So, because the years are sometimes tough but all-the-time wonderful, I am providing a list of 13 things I wish I knew when I was 13. 1. Your mom and dad always love you. Even when they don't let you go out, or embarrass you in front of your friends, or insist that the first boy you go on a date with has dinner with the entire family, they love you. More than you can probably ever comprehend. 2. The girls you think are breathtakingly gorgeous with not a single flaw still have their own issues. The girls you think are perfect still go home and wish they could change things about their lives. Nobody has it all figured out. 3. On that note, there is and will always be only one you. So even if you don't get the blonde hair, or the cheerleader body, or the skin that gets a golden tan, you are beautiful in your own way, a way that is uniquely you. Embrace that. Focus on being a better you instead of a better copy of someone else. 4. When you say "no" to the first boy you say "no" to, and he is rude or tells his friends nasty things about you, find it in yourself to ignore it. Because I can promise you, when you are twenty writing a list to a special 13 year old, you will not remember a single one of those boys as a good part of your life. In fact, you probably won't remember them at all. 5. Take chances, take risks, and try new things. Teach yourself a new language, or an instrument, explore any talents you have or anything that you are remotely interested in. 6. Enjoy not having a job. Enjoy not driving. Enjoy being a teenager. There is plenty of time in life to be an adult, and there is absolutely nor reason to rush it. 8. Always remember that makeup is to enhance your beauty, and not make it look like you are going to a circus. You don't need makeup anyways. Also, don't over-pluck your eyebrows. Or let your friends box color your hair. 9. Eat the cupcake. Drink the milkshake. The joy of being a teenager is that eating junk food just comes with the title. 10. You are going to have friends that betray you, they may lie, or say or do something hurtful. Take those moments as a positive. They weren't meant to be in your life. And remember that just because someone hurts you, doesn't mean you need to hurt them in return. 11. Put down your cell phone and live a little more. Don't post things you will regret later. Look at people's eyes instead of your phone screen. Don't spend your entire weekend in front of the T.V or computer. Life is so good, be present. 12. You never outgrow your parent's hugs, kisses, and unconditional love. Don't fall in to the teenager trap of being "too cool for everything." And don't wear mega push-ups bras, low-cut shirts, or short shorts. Trust me, the guys who are into that are not the guys to be into. 13. Above all, love yourself. Fall in love with the amazing person that you are. Don't be too critical of yourself. Tell yourself each day that you are beautiful, special, kind and smart. I wish I would have known that. I wish I would have spent more time enjoying life instead of analyzing my face, hair, and body in front of a mirror. Don't try to change too quickly, and don't rush the years, them move quickly on their own. Spend time laughing, smiling, dancing and loving. Happy Birthday, gorgeous girl. I hope this year and every year that follows brings you happiness. I hope you carry yourself in a way that makes you proud. Know that wherever you are and however old you get, you are still that little girl you once were with faraway dreams, and no cares in the world. Know that you are always loved. 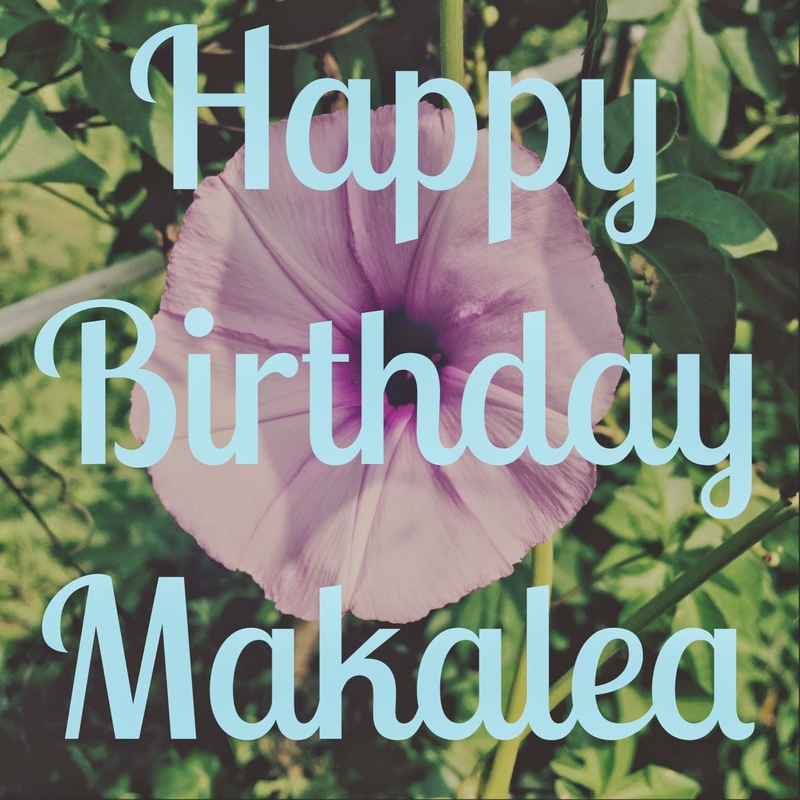 Here's to celebrating you, sweet Makalea. I hope 13 is as wonderful as you are. Havibg my daughters read this post...such great advice! Thanks for sharing it with all of us. This is such great advice! I definitely need to save this for when my little girl gets older. Of course she's almost 2 now so it might be awhile, but still. thanks for this! So beautiful.